Brazil is a global leader in the provision of financial services through branchless banking. Moreover, in the last decade the country has seen a dramatic demographic shift in its population, with 28.8 million people moving out of poverty and into the middle class. This growth has created incentives for banks, which traditionally have been used to serving higher income segments, to move down market and develop new products for the lower income segments. However, despite this push for new channels and products for the poor, few providers have managed to contextualize and truly understand the complex financial lives of these diverse and emerging groups of people. Now more than ever, the need to design and roll out suitable products that meet the needs of lower income segments is essential. Caixa is Brazil’s largest public bank and the distributor of the country’s flagship federal assistance program, Bolsa Famlia. Since it serves such a large portion of Brazil’s low-income population, the bank wanted to design financial products that would work better for its customers. To accomplish this, Caixa partnered with CGAP to conduct a six-month research project based on financial diaries work and ethnographic research among recipients of social welfare payments. CGAP carried out the work on the ground with Plano CDE, a local research partner, and visited 123 families in Rio de Janeiro, Sao Paulo, Salvador and Recife, from January to June 2013. We conducted several interviews per household, with each interview focusing on a different aspect of household finances, such as income composition, debt, and consumption (among others). By conducting multiple interviews per household we developed a deep understanding of the beneficiaries’ social and financial realities. In total, the study included information from 1,107 interviews with women aged 18 to 50 years old, who have children, and are beneficiaries of government cash transfer programs like Bolsa Familia. (More background on this research is available on the CGAP blog from August and October 2012). While much has been discussed the past couple of years about the Brazilian economic miracle, the fact is that 57.2 million Brazilians still belong to the poor and vulnerable classes. One of the first things we noticed in our research is that household income for lower-income families is extremely volatile. Incomes fluctuate significantly month to month, especially for households who rely on freelancing, one-off jobs or informal forms of employment (bicos). For example, the chart below tracks one household’s income level during the project. Income fluctuated so significantly that this family fell into four different income categories within a six-month period, ranging from extremely poor to low-middle class. We saw similar fluctuations in other households in the sample. In fact, the breakdown of income categories covered by our sample changed pretty dramatically during the project. 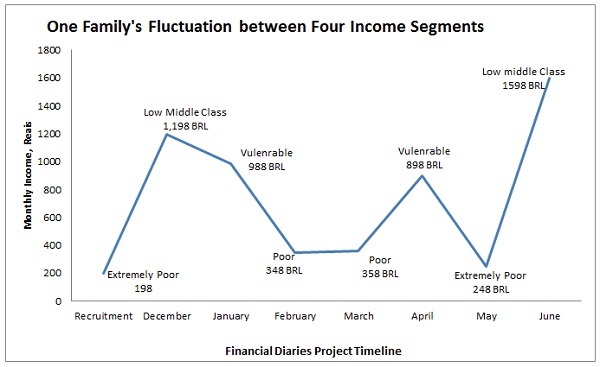 When the project started in January, 72% of households were in the poor and vulnerable classes, but by June, this proportion had dropped to 46%. This pattern is representative of many households in the country that supplement income from social protection programs with additional sources. It also demonstrates that the new middle class is extremely vulnerable and can easily drift back down into poverty. The seasonality of income is a reality that has a detrimental impact on family budgets across all income profiles. However, when we look closer at the financial data, we find the greatest income fluctuation is seen among middle-class families and not among the poorest, as illustrated by the graph below. One explanation for that may be that the poor account for the unpredictability of their income into their behavior: they know how to live with restrictions; they organize themselves better to deal with financial shocks; they work hard to maintain their social network to increase the chances for obtaining back up work; and are more resilient when unexpected things happen. On the other hand, the middle class that has just ascended from poverty has few mechanisms to deal with the fluctuation of income in this new context. This middle income segment, which has experienced significant income growth just in the past few years, suffers even more from income fluctuations. Although they have more access to formal sources of income, sudden unemployment can bring dramatic consequences to household and even send a family back into poverty. This scenario demonstrates that the lower income segments require a portfolio of financial products that meet their diverse needs. The diaries project revealed definite needs for products like automatic savings, emergency cash relief, and flexible payment plans for bills or debt. that However, the access to suitable financial products and services is just one part of the solution. Considering the conclusions from this research, choosing and using the right products for each household is essential to ensure sustained livelihoods. Brazil is seen as a global leader in branchless banking and as an example of how banks have created wide-reaching branchless channels that use cards and point-of-sale (POS) devices at various retail locations.However, challenges remain. Using data from a national household survey in Brazil, we segmented Brazilian respondents into six categories: Financially Excluded; Unbanked Bill Payers; Selective Users; Privileged Agent Non-Users; Banked Bill Payers; and Agent Super-Users. With more than 400,000 agents, Brazil has one of the largest agent networks in the world, but their impact on financial inclusion is mixed. This sounds like a very interesting and useful project. Can I get access to the raw data from this project?